Someone once said, “whether you believe you can or you can’t – you’re right!” Well, Roger Bannister believed that he could. No one had ever run a four-minute mile – it was considered impossible for a human being. 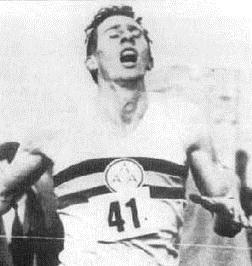 But Roger Bannister believed that he could break the “impossible” barrier. So, on March 6, 1954 at Oxford University, he set out to break the record. In the first 2 laps, he was ahead of pace, but three-fourths of the way into the race, he fell behind the pace needed to break the record. Things looked grim. But 300 yards from finish line, he went into his kick. The crowd was on their feet, cheering him on. He collapsed in a heap as he crossed the line. 3:59.4 seconds. His record was broken 46 days later. That’s amazing! Once one person broke the “impossible” barrier, others followed quickly. In fact, a four-minute mile is now the standard for professional runners. The mile record has been lowered by 17 seconds! It wasn’t impossible after all! How about you? What “impossible” barrier are you facing? Let’s focus on the Belief System. Where do beliefs come from? 1) Our environment – this is where “Dreamstealers” are especially dangerous. You know who they are. How many times have you heard, “You can’t do that! You’re crazy!” Don’t listen to them – move forward with living out your dream! 3) Past Successes – If you succeed at one thing, it is much easier to succeed at other things. Past successes are key events that help change the paradigm of “I can’t”. 4) See it as though it had already happened – Athletes do this all the time – they focus on every part of their performance before they actually perform. They see every move, feel every sensation. The practical impact of this is that they have a “Past Success” – not in reality yet, but in their vision. Dr. Benjamin Bloom of the University of Chicago did a study of 100 extraordinarily gifted athletes. Surprisingly, he found that they didn’t start out by distinguishing themselves as super-athletes. Their success was an outgrowth of careful attention, direction and encouragement by others. Their belief that they could excel came before the proof of athletic success. This entry was posted on Wednesday, September 28th, 2011 at 9:10 pm	and tagged with 4 minute mile, achieve, believe, dreams, inspiration, Inspirational stories, motivation, Roger Bannister, success, terry newberry, track and field and posted in Uncategorized. You can follow any responses to this entry through the RSS 2.0 feed. thanks so much! Please keep reading! I conceive this web site has very wonderful composed subject material posts. thanks so much! Thank you for reading! Keep up the wonderful piece of work, I read few posts on this site and I think that your site is really interesting and has got bands of good info .